The fact is, it was just fifty years ago today that the poll tax was eliminated as a voting requirement in federal elections. The poll taxes impacted by the amendment were not the poll taxes genealogists tend to think of and use in doing our research. Those very early poll taxes were general revenue measures, authorized as far back as as the 1630s by the General Court in Massachusetts and the Virginia colonial authorities. And so the end came to the poll tax. Beginning with a constitutional amendment. Just fifty years ago today. 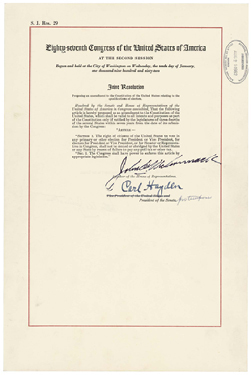 Image: Joint Resolution Proposing the Twenty-Fourth Amendment to the United States Constitution, 08/27/1962 – 08/27/1962; Enrolled Acts and Resolutions of Congress, 1789 – 2011; General Records of the United States Government, 1778 – 2006, Record Group 11; National Archives, Washington, D.C.; digital image, Archives.gov (http://www.archives.gov : accessed 22 Jan 2014). Ah, Mr. Justice Douglas, outfoxing Messrs. Justice Black and Harlan again. Moowahahaha! And Stewart, too. He dissented in the Harper v. Virginia Board of Elections case. Yeah, but I like Stewart. Anybody who can say in an opinion, “I know it when I see it,” doesn’t need to be rankled. Besides, anytime Harlan could be diddled, as it were, was a good thing. And a week ago today Pennsylvania’s voter ID law was struck down in state court, and the whole thing is likely headed back to the Supreme Court again. Skirt lengths go up and down, but some things never change. The parallels between post-Civil War Reconstruction laws and modern “voter ID” laws are striking, aren’t they? Dear Legal Genealogist. Interesting article. I think you could also add that the poll tax effectively disenfranchised a very large number of poor whites–a group probably as large if not larger than the black male population. The net effect was that voting was a wealthy white man’s game. The old Byrd “organization” in Virginia was testimony to that. Winning elections was simply a matter of corralling the few people who could afford to pay the poll tax. And when most of them all agreed on everything (including the spoils) it was effectively a one-party state. It certainly did disenfranchise the poor disproportionately, but more poor whites could raise the cash than minorities. I am catching up. With one notable exception (a great teacher), I wish my high school history classes had been this informative and succinct… Thank you!